This has become one of my favorite series. It's a time period that is totally unfamiliar to me and I love that it's my 'first' experience learning about Emma of Normandy. 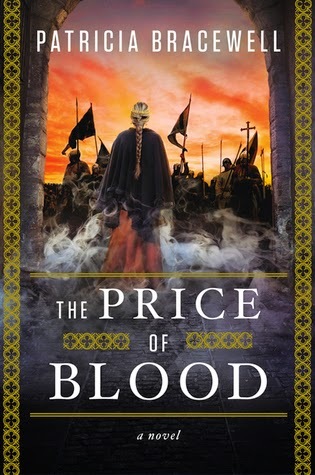 Shadow on the Crown was an audio read, which I enjoyed tremendously, this time I opted to read The Price of Blood - one of the advantages is the fact that I now know how to pronounce everyone's name. Beginning where Shadow on the Crown left off there is a lot going on in this book. Now don't get me wrong, it's not confusing or whelming at all, in fact the opposite. With each story line I was (am) eager to find out the overcome. There is the King who is still haunted by his brother's ghost, from his POV we see his state of mind. Queen Emma, protecting her young son and what she must do to keep him safe, it's about forbidden love and knowing who you can trust. The Vikings continue to wreak havoc on England and that lady Elgiva spices things up and I like her. Like I said in my review of Shadow on the Crown, though there is not a lot of historical documentation from this time period and the author has woven a wonderful tale that kept me captivated and rather sad when it ended. Patricia Bracewell's ability to fill in the gaps of history is exceptional, her knowledge of this time period shows the staggering amount of research that was involved in this series. She created these real historical characters and situations into something authentic and believable. My interest in this time period has peaked and having discovered a couple of other books that take place around the life of Emma I am reluctant to read them until this series is completed. Which makes me ponder when book 3 is coming out. If you are a fan of HF with a strong female lead then start this series, but be sure to start at the beginning with Shadow on the Crown, trust me you won't be disappointed.